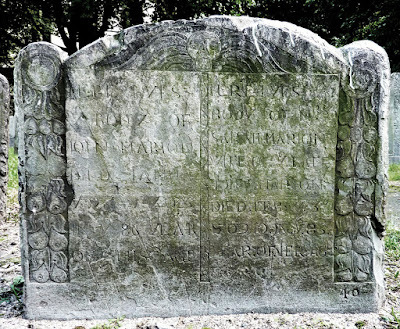 The Family Connection: John Marion and Sarah Eddy of Boston and John Marion and Sarah Unknown of Hampton...oops! John Marion and Sarah Eddy of Boston and John Marion and Sarah Unknown of Hampton...oops! Attention ya'll! If you are a descendant of Henry Dearborn and his wife Elizabeth Marion and you think you are related to Sarah Eddy, get out your pruning shears, it's time to lop that branch off your family tree. Unfortunately there were two men named John Marion who came to New England. One married Sarah Eddy and the other married Sarah Unknown. Their genealogies have become mighty mixed up. This messed up genealogy is still being printed today. Here is a breakdown of the lives of the two men named John Marion. Obviously they were not the same man. b. 1620, based on date of marriage, but possibly earlier. served for many years as selectman up til 1697. "Find A Grave," indexed database, Find a Grave (http://www.findagrave.com : accessed 19 February 2016), memorial page #48032980 for John Marion 91619-1706) with gravestone images, created by GravRidr, Citing Kings Chapel Burying Ground, Boston, Suffolk, Massachusetts. Richard D. Pierce, The Records of the First Church in Boston, 1630-1868, Volume 1, (Boston: The Colonial Society of Massachusetts, 1961). Records for all the baptisms of the children of John Marion. "Early Vital Records of Massachusetts from 1600-1850," database, Massachusetts Vital Records Project, (ma-vitalrecords.org : accessed 19 February 2016), >Towns > Middlesex > M > entry for Mary Marian daughter of john and Sarah. Mary was buried 15: 3mo: 1641 a. 2m. "Early Vital Records of Massachusetts from 1600-1850," database, Massachusetts Vital Records Project, (ma-vitalrecords.org : accessed 19 February 2016), >Towns > Middlesex > M > entry for John Marian son of John and Sarah. John was buried 15:3 mo: 1643. Joseph Dow, History of the Town of Hampton, Volume 2, (Salem : L. E. Dow, 1893), 834, digital images, Archive (archive.org : accessed 19 February 2016). George Francis Dow, Records and Files of The Quarterly Courts of Essex County, Massachusetts, Vol 1, 1636-1656, (Salem : Essex Institute, 1911), 177, digital images, Archive (https://www.archive.org). Richard Swaine to pay his witness fees. George Francis Dow, Records and Files, Vol 1, 251. George Francis Dow, Records and Files, Vol 1, 252. Sued by Richard Swaine for mowing his meadow and taking away his hay and endeavoring to take away the title to his land. George Francis Dow, Records and Files, Vol. 1, 279. Served on the Gran Jury at Salisbury. Hampton Town Records, book one index, database, Hampton Historical Society (www.hamptonhistoricalsociety.org/town-records/book 1_index.htm : accessed 19 February 2016). Robert Charles Anderson, The Great Migration Begins: Immigrants to New England 1620-1633, Volumes I-III, (Boston : New England Historical and Genealogical Society, 1995), 2063, digital images, American Ancestors (https://www.americanancestors.org). Robert Charles Anderson, Great Migration: Immigrants to New England 1634-1635, Volume II, C-F, (Boston: New England Historical and Genealogical Society, 2001), 158, digital images, American Ancestors (https://www.americanancestsors.org). Land sale from Thomas Coleman of Hampton to John Marion of Hampton, 8 acres of salt marsh. Robert Charles Anderson, Great Migration, 1634-1635, 158. Thomas Coleman of Hampton sells 4 acres of fresh meadow to John Marion of Hampton. George Francis Dow, Records and Files of the Quarterly Court of Essex, Massachusetts, Volume 3, 1662-1667, (Salem : Essex Institute, 1913) 279. George Francis Dow, Records and Files, Vol. 3, 450. Fletcher S. Weyburn, Weyburn-Wyborn genealogy : being a history and pedigree of Thomas Wyborn of Boston and Scituate, Massachusetts, and Samuel Weyburn of Pennsylvania, with notes on the origin of the family in England, and several branches in Kent County in particular, (New York: Frank Allaben Publishing Co., 1911) 16, digital images, Archive (http://www.archive.org : accessed 19 February 2016). Fletcher S. Weyburn, Weyburn-Wyborn Genealogy, 18. George Francis Dow, Records and Files of the Quarterly Court of Essex, Massachusetts, Volume 4, 1668-1671, (Salem : Essex Institute, 1914) 261. George Francis Dow, Records and Files, Vol 4, 325. Charles Henry Pope, Pioneers of Maine and New Hampshire 1626-1630, (Boston: Charles H. Pope, 1908) 133, Google Books (https://books.google.com : accessed 19 February 2016). Pope recognized that Sarah Marion was not Sarah Eddy. Clarence Almon Torrey, New England Marriages Prior to 1700, (Baltimore: Genealogical Publishing Company, 1985) 307, digital images, Google Books (https://books.google.com : accessed 19 February 2016). Charles Henry Pope, Pioneers of Maine and New Hampshire, 133. Robert Charles Anderson, Great Migration: Immigrants to New England 1634-1635, Volume II, C-F, (Boston: New England Historical and Genealogical Society, 2001), 611 , digital images, American Ancestors (https://www.americanancestsors.org). Will of John Eddy, names daughter Sarah Miriam and her husband John Miriam. George Francis Dow, Records and Files of the Quarterly Court of Essex, Massachusetts, Volume 6, 1675-1678, (Salem : Essex Institute, 1916) 265, digital images, Archive (https://www.archive.org). Nathaniel Bouton, Isaac Weare Hammond, Albert Stillman Batchellor, Henry Harrison Metcalf, Otis Grant Hammond, Provincial and State Papers, (Manchester : J. P. Clark Printing, 1891) 658-660, digital images, Archive (https://www.archive.org : accessed 19 February 2016). Boston (Mass), A catalogue of the city councils of Boston, 1822-1908, Roxbury, 1846-1867, Charlestown, 1847-1873 and of the selectmen of Boston, 1634-1822, also of various other towns and municipal officers. Printed by order of the City council, (Boston : City of Boston Printing Department, 1909) 363, digital images, Hathi Trust (http://babel.hathitrust.org/cgi/pt?id=mdp.39015006989886;view=1up;seq=367 : accessed 19 February 2016). Nathaniel Bouton, Documents and Records Relating to the Province of New Hampshire, Volume 1, (Concord : George E. Jenks State Printer, 1867), 458, digital images, Archive (https://www.archive.org). Robert Charles Anderson, Great Migration: Immigrants to New England 1634-1635, Volume II, C-F, (Boston: New England Historical and Genealogical Society, 2001), 612 , digital images, American Ancestors (https://www.americanancestsors.org).